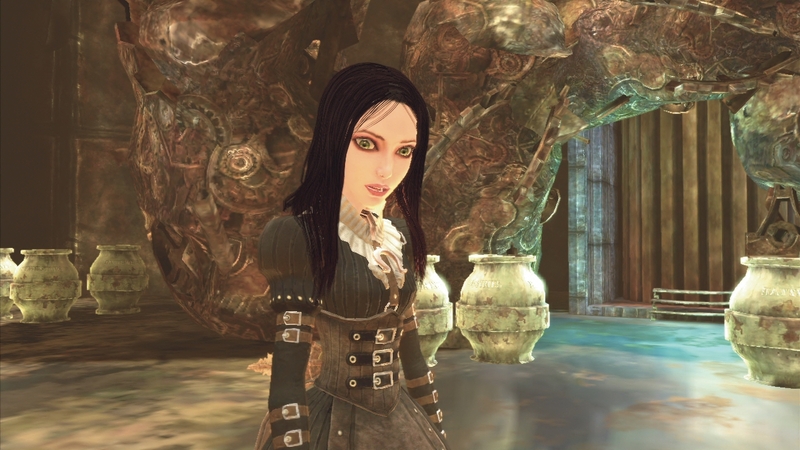 Madness Returns is the second Alice game from American McGee. Turning the classic Wonderland tale into a dark, twisted nightmare earned the original game a cult following. Now Alice is back, and she's after a much wider audience. Does the game do enough to deserve this audience, or will the game follow in the footsteps of it's predecessor and live on as a cult classic? The game starts in London, with Alice in a therapy session. The cut scenes are presented in a paper cut out style, and look superb. They work incredibly well with the twisted fairy tale theme that the game carries. Soon enough, you are able to walk around the streets of Victorian London. It is very linear, as is the majority of the game, but the atmosphere is fantastic and the streets feel grimy and dangerous. After following a curious white cat, you are plunged into Wonderland for the first time. The game is set in both London and Wonderland, with the latter obviously being the main attraction, and where you will spend most of your time. The Wonderland levels range from beautiful forest, to hard, rusty industrial zones, to the serene arctic tundra style levels, and that's just a taster. 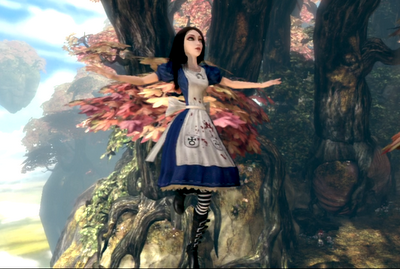 The graphics in Wonderland are superior to the London level graphics, but the graphics overall are very inconsistent. Sometimes the graphics look amazing, particularly on Alice, but often the textures look pixellated and not as good as they should be. The levels are quite linear but the puzzles break up the action, along with some decent platforming fun, not dissimilar to Mario games. You typically must traverse the levels to find items and help characters, in order to progress through the levels. The levels are typical of the platforming genre. Do some jumps, flick some switches, kill some enemies and hey presto! It's all been done before, so whilst the game doesn't offer anything new to the genre, it does what it does well. The levels do have a lot of hidden content, which reveal back stories, information about the Alice universe and it's characters, and add a decent amount of game time. More often than not, you'll also find teeth. Teeth are the currency of Madness Returns. Killing enemies and breaking containers will usually earn you some, and if you're lucky, even some gold teeth. Collect enough and you can upgrade your weapons. The first weapon, which you come across almost instantly, is the Vorpal Blade. A standard melee weapon which is great for dispatching all kinds of enemies. If melee isn't your thing, you also get the Pepper Grinder very soon after the knife. This allows you to fire peppercorns at your enemies, and is a powerful ranged weapon. The weapons are easy to access and switch between, but the combat does all feel the same. A solid platform game with a decent story and characters, let down by some repetitive combat and very linear levels. If you're a fan of the first, you'll undoubtedly like this. Even if you aren't, it's worth a try, as the original game comes bundled with Madness Returns, in the form of a download code. Wonderland will never be the same again.